It is good business to know your costs. Firing costs have always been somewhat of a mystery to many ceramic artists. While there are many variables that can affect the cost, the calculation is fairly easy. The new Skutt controller will actually calculate it for you after each firing and if you have KilnLink, it will automatically store those costs on your own personal “MySkutt” page. If you are working with an older kiln and do not have this feature you can easily calculate it using this formula. Example: KM1231PK 208V 1 PH kiln firing a Medium Speed ConeFire Mode Program to Cone 6 using a USA average electrical rate of $0.12 KW/Hr and a load of 100 lbs in the kiln. So $11.84 to fire one of our largest kilns with a full load to CONE 6! A lot less than most people think. A model 818 fired to Cone 06 was only $2.83. Now I know that a lot of you are pretty observant and are saying “hey. what is this mysterious Adjustment Factor?” In order to better understand this we need to look a little closer at all of the variables individually. You will see why this number is a sort of best guess due to the variability of variables. This one is pretty straight forward. If you look on the serial plate on your control box one of the pieces of data is the Wattage rating of the kiln. This is the amount of energy that particular model uses when it is brand new and on 100% of the time for 1 hour. Since you are charged in Kilowatt hours, and this number on the control box is listed in wattage hours, you need to divide this number by 1000 before plugging it into the formula. The cost of electricity varies all over the nation. It is usually affected by the amount of locally generated power available to a given population. Because some areas have less power than they would like, they ration it out by charging different rates based on when you use it or what type of consumer you are. You may want to see if you get lower rates if you fire at night. If you are estimating the cost of firing your kiln in a commercial building, be sure to use the rate listed on the businesses energy bill and not your one at home. Rates can vary between $0.08 (Washington) and $0.38 (Hawaii) per kilowatt hour with the USA average being at $0.12/KW/HR for residential and $0.10 for commercial. The nice thing about the new Cost calculation feature in the new KilnMaster Controller (manufactured after July 2012), is that it actually calculates how long the elements are actually on. As you probably know from hearing the relays clicking, they cycle on and off to achieve the correct firing rate. The frequency of this cycling will depend on the program entered and the ability of the kiln to follow the program entered. Programs that have fast firing rates or that approach the maximum temperature rating of the kiln will generally require the relays to stay on longer. Conversely, programs with extended hold times will require less “on time” for the relays. Obviously when your relays shut off power to the elements, you are not incurring any cost so this “off time” needs to be accounted for. We have found that a good estimate, across the range of ConeFire Mode programs, is 50%. If you have a KilnMaster kiln manufactured after July, 2012 you can Click Here to find out how to configure it to calculate your firing costs. NO!!!!!!!!!!! Ok…sorry for yelling. The Fast speed is just for lower temperature firings like Decals and Lusters. Now it is true that Potters have used the fast firing speed and have gotten away with it…but…is it really worth the risk to save a few hours? Just think of how awful you would feel opening your kiln to find shards of ceramic pieces on the shelf. Then you have to clean out the whole kiln, and if pieces got on the elements and melted, you have to order new elements. Stick with Slow for Bisque and Medium for Glaze firings and reduce your stress levels. This is done in industry and by experienced high fire potters. You may have heard the term “Monocotura” if you ever shopped for tile. This is an Italian term that literally means single fired. It generally is considered to be higher quality because the glaze bonds better to the clay. This works in industry because they have Ceramic Engineers controlling every step of the process from materials selection to glaze application to the firing process. In a studio setting, it could spell disaster. You will more than likely end up with a lot of glaze defects like pin holing. If something is going to blow up in the kiln, it is almost always going to happen during a bisque fire. Wouldn’t you rather this happen before you have glazed the pieces. Ultimately this is your decision to make. All manufacturers recommend that you are present when the kiln is scheduled to shut off. This is to make sure the kiln shuts off as expected to protect your ware and the interior of your kiln. Kilns are meant to contain heat so fire is not the issue. I don’t think you sit around and watch your furnace all night so why would you watch your kiln. Anyway, if your kiln is electrically sound (just like any other electrical machine, the room is secure from children and pets, and there is no combustible material in the room that may come in contact with the kiln, it should be fine. If you want the piece of mind of being able to monitor your kiln from your smart phone check out KilnLink. As a matter of fact you can. 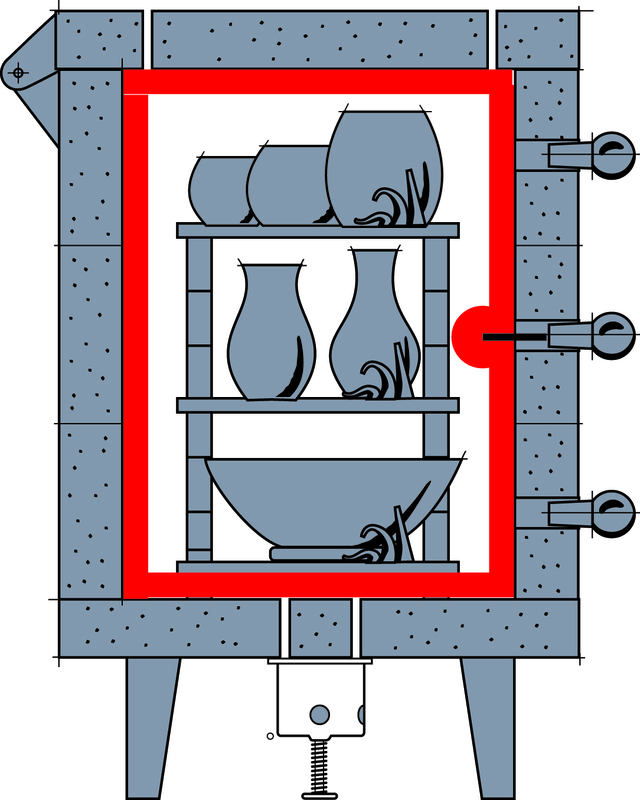 For years it was believed that glass could only be fused in a kiln with elements in the lid. Artists worried that if you tried to fuse glass in a side-fired kiln the temperature difference between the edges of the glass near the elements, and the center of the glass would become to great and the piece would crack. We discovered that if you slow your firing program down you can keep this temperature difference to a minimum and the fused pieces come out just fine. When you fuse in a side fired kiln you have the advantage of being able to load pieces on multiple layers so you can fire an entire class’s projects at one time. NO! Sorry, there I go yelling again. We are just trying to help you make your kiln last longer. The fact is, your kiln hates moisture. The moisture from the clay attacks anything that is metal in your kiln. This includes your bands, elements, thermocouple and hardware. If your kiln was made within the past 10 years you will notice the first question it asked you when you are programming is “How long do you want to Preheat?”. The Preheat feature is to ensure that the small amounts of moisture left in the greenware is drawn out before the kiln reaches temperatures high enough to cause the moisture to turn to steam and potentially damage the piece as it is released. A good rule of thumb is to hold the greenware up to your cheek. If it is cool, it still has moisture in it. If it is room temperature it is ready to be loaded. When you are entering a ConeFire program the last question it asked you is how long do you want to hold at peak temperature? A hold time can serve several purposes. probably the most important function of a hold time is to allow the kiln time to “balance out”. If a kiln is loaded denser in a particular part of the kiln it can take a little longer for those pieces to reach temperature. A 5 minute hold time can give those pieces that are lagging behind time to catch up with the rest of the kiln and therefore “balance out”. Remember, that a 5 minute hold is entered 00.05 not 05.00 (like your microwave). I 5 hour hold could ruin all of the pieces in your kiln. We rarely recommend entering a hold time in ConeFire Mode of more than 20 minutes. Why does my ware fire unevenly across my shelves? Many of us have been told over the years that it’s ok to tightly pack a bisque load and we all want to use the space in our glaze firings as efficiently as possible. Because of this, is has become a common occurrence to overload kilns shelves which reduces the ability of the kiln to produce evenly controlled firings. Keep in mind that both bisque and glaze firings involve complex chemical reactions that require oxygen to succeed. Not allowing enough space around your ware will prevent the items from ‘breathing’ and can create underlying chemical issues in your bisque ware or uneven glaze results. This not only applies to the spacing between items on the shelves, but also to the spacing and placement of your kiln shelves, remember your shelf placement can affect the movement of the atmosphere inside the firing chamber. In many cases smaller items, especially tiles and plates, cannot ‘see the elements’ if larger items are blocking direct line of sight to the heating elements. Being in the ‘shadow’ of these larger items means they are not getting as much heat as they need. Loading techniques like “Doming“ the load can sometimes quickly solve this problem. Watch this video to find out what we mean by doming the load and others tips.